We hear a lot about failed states, and we wonder what we as Americans should do. Sometimes the threat of a failed state goads us to intervene abroad to protect our interests. That might mean American business interests, it could mean preventing the setup of terrorist safe havens, or maybe we just want to give ourselves a reputation for doing good. Recently I’ve been looking at some Chicago crime data, and it struck me that since 2001, among the 5.75 million crimes in their database, there were 6,620 homicides (represented below). 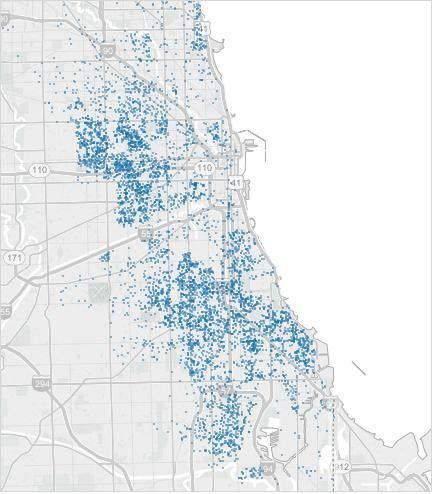 This map makes Chicago look like a war zone, and it’s a city I don’t think anyone would consider as “failed”. This is especially true since murder rates have been dropping in recent years. Comparing Chicago’s murder rate (from this FBI table) to the World Bank’s figures for homicide, Chicago’s 2013 rate is similar to Afghanistan’s 2012 rate. This surprised me. Could America really be as dangerous as Afghanistan? Note, Afghanistan’s “homicides” don’t include war deaths. I feel safer walking around the streets of Portland, OR than I did in Brussels. But, again looking at the World Bank table, Portland, OR is about as safe as Slovakia. America is a very diverse place. Any attempt to categorize it as safer / less safe than another country is bound to prove futile. So I did the next best thing. Below is a map of major American cities. The dot size is population. The more red, the higher the murder rate. But instead of labeling them with city name, I labeled them with the country whose 2012 homicide rate from the World Bank data most matched the FBI’s murder rate rate from 2013. 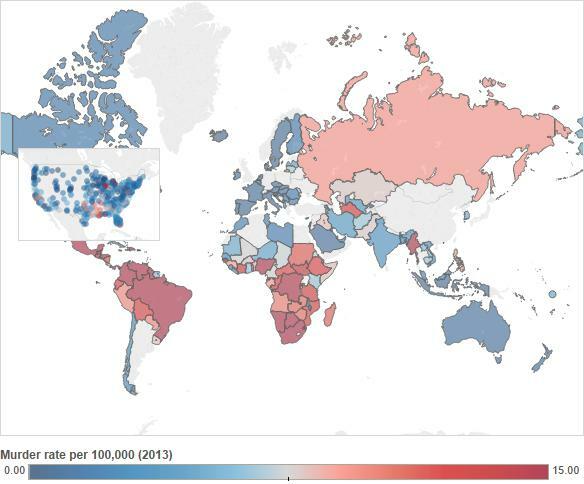 Some cities stick out for matching up to countries that are obviously not doing well. Baton Rouge, LA and Merced, CA are about as safe as Haiti. New York, NY is doing better, and is about as safe as India. Some American cities (usually smaller, better-governed) were more like Denmark or Finland. For a different view, below is a map of the world by murder rate, with a by-city look in the United States superimposed. America doesn’t compare well to Europe or Canada, but compares very well to fellow new-world countries in Latin America. Africa and Russia also stand out as being more dangerous. The places in America that stand out as particularly dangerous are in the deep south around Louisiana, near Detroit and in some parts of the southwest. This may be pure coincidence, but it struck me that French-speaking / slave descendants in Louisiana and Haiti would have approximately the same murder rates. I wouldn’t think that language has any role to play in violence, but I remembered that the Caribbean, South America & parts of the south were central to the cultivation of sugar cane, and involved a much more brutal form of slavery than that even practiced in the growing of cotton (not to excuse slavery in the cultivation of anything, anywhere). 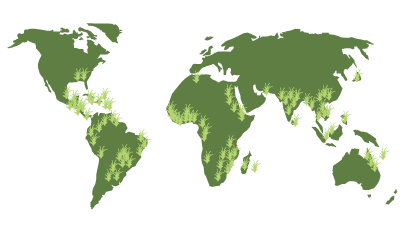 I found this map of sugar cane cultivation today from sugarcane.org. This is current production – I was unable to find a map of sugar cane cultivation from the 1700-1800’s. But the brutalization of human beings to a point where life expectancy of a slave in those areas approached seven years would lead me to believe that societies based on shakier foundations might have a tendency towards greater violence, even until today. This is hypothetical, but could be interesting for further study. For different view, see the table of the top 100 American cities by murder rate. For reference, the overall US murder rate per 100,000 inhabitants (World Bank) was 4.7. The below 100 MSA’s are all above 5.4. Detroit, depending on which other areas you compile it with to make an MSA, is as violent as Nigeria (with a horrendous 20.4 murders per 100,000) or Peru (down to a still shaky 9.6 murders per 100,000). No city in America is as violent as 26 of those most dangerous countries on earth — a list that includes Mexico (21.5), Rwanda (23.1), Brazil (25.2), Columbia (30.8), South Africa (31), Venezuela (53.7) and Honduras (90.4). 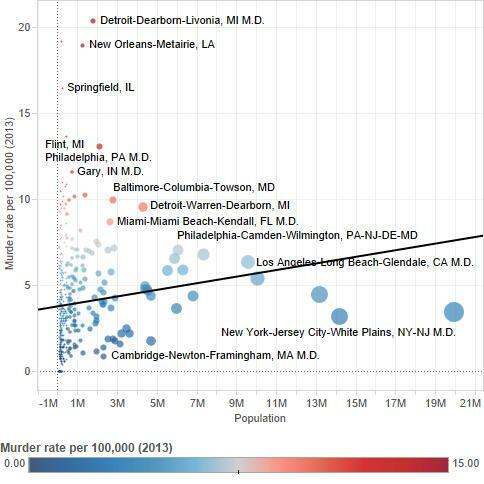 I also wanted to correlate an MSAs population size with murder rate. There is a significant relationship, but enough outliers that you can’t model it well. What can we gather from all these visualizations? First off, parts of America are very safe, parts are very dangerous. You probably knew that, but that some major American cities are as dangerous as Nigeria or Haiti or Afghanistan or Russia is still shocking. The reverse is also surprising, that in other places you might as well be in Denmark or Slovakia. Secondly, for those of you who think issues of race and racism are dead in America since the election of President Barack Obama, think again. The legacies of slavery, racism towards migrants to the north, poor government services rendered in more diverse places in the country are still with us. That more violent countries had more slaves later on doesn’t seem a coincidence (and it’s not all black slavery: Russia is more violent, and it liberated its serfs in 1861). I’m not sure how the chain of causation runs. Perhaps higher rates of slavery (or more violent forms of it) equals poorer governance equals higher murder rates today. Traffic in illegal drugs certainly plays a factor. In any case, America is not immune to either.